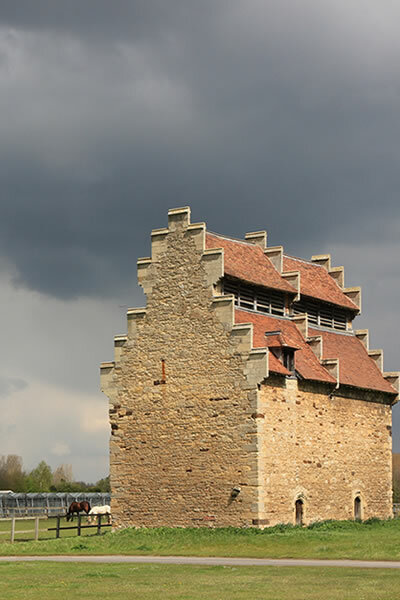 Answering the question – what is a dovecote? 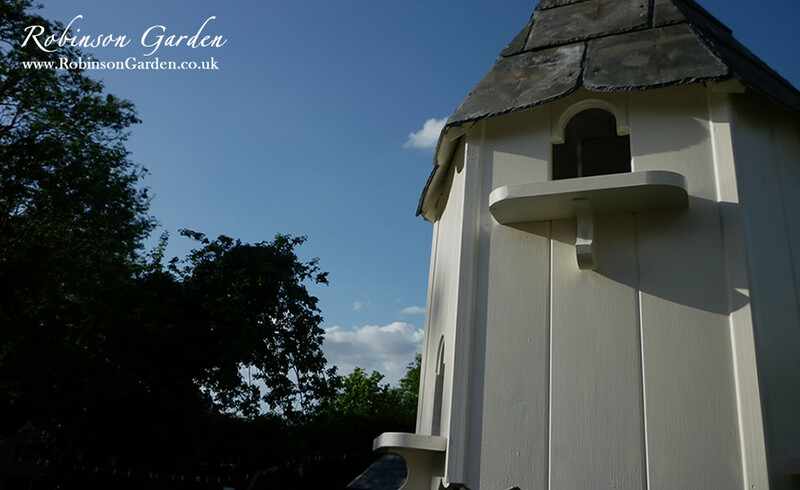 A dovecote is a structure designed to house doves, pigeons, and other small birds dependent on your own preference. 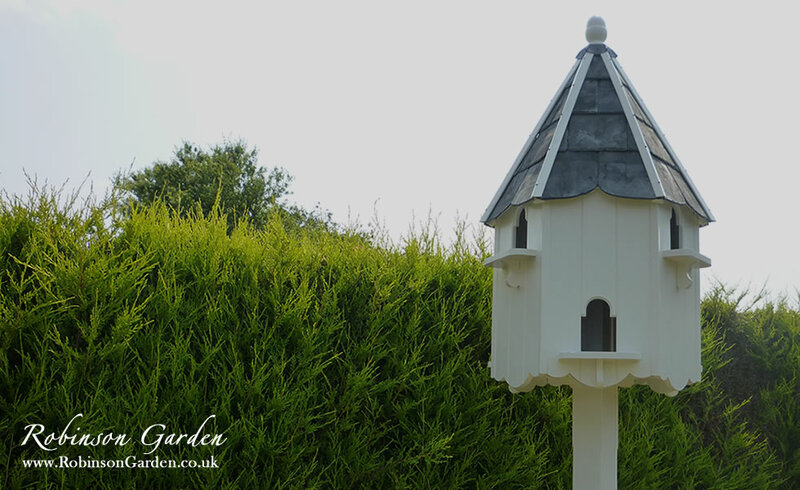 These structures provide a safe environment for pigeons to nest in, as well as creating a clear home base for the birds, this encourages them to settle and make a dovecote their ideal home. 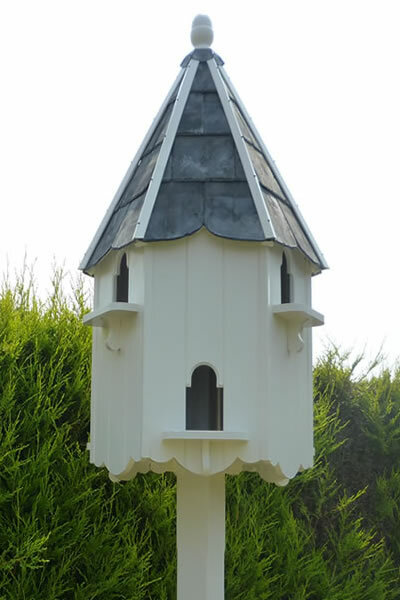 Modern dovecotes purchased today are often used to house racing pigeons and other hobby birds including ornamental doves. 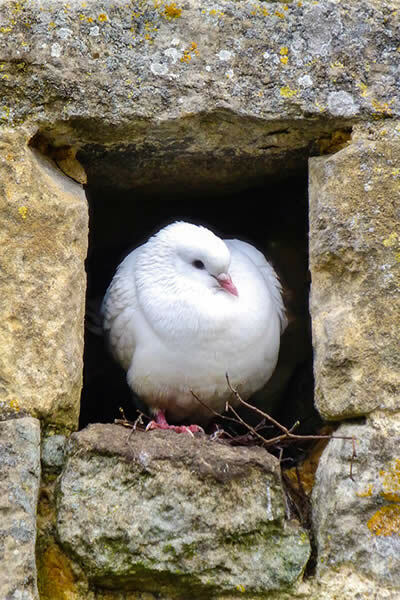 The keeping of ornamental doves in garden settings started to become popular during the 1920s, and this trend has continued right through to the present day. 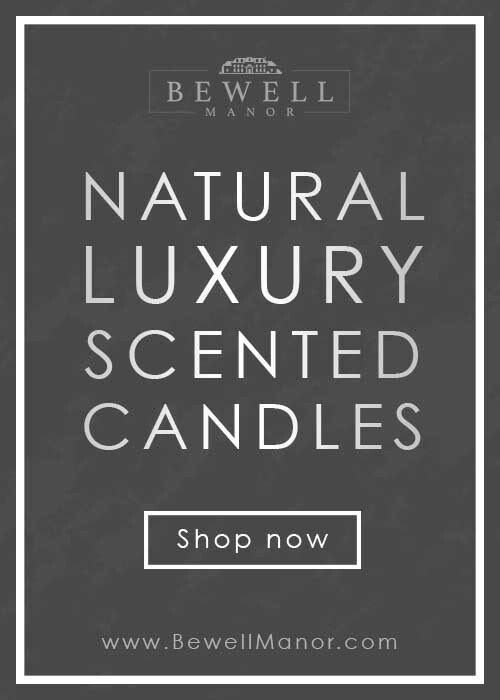 Over the years, there has been a vast array of names for these beautiful structures, examples include: dovecot, dove cote, dovecote, pigeon cote, dove house, Doocote and many more. You may be pleased to know, they all mean the same thing and derive from language and regional differences. A note on terminology: a dovecote or pigeon house may appear in English-language documents as a culverhouse, in Scots as a doocot and in Latin as a columbarium. Historically, pigeons and doves were an important food source for the wealthy, providing tender meat and eggs. These beautiful birds were also used to carry messages, and their manure was a great form of fertilizer. People kept varying numbers of birds in their dovecotes, in some parts of the world a flock of doves was a status symbol. In some regions of the United Kingdom, dovecote construction was regulated and ownership of the birds was restricted to people of a certain social rank. Some very fine examples of ornate dovecotes can be found at old manors in Europe. Several basic design features are common to all dovecotes. They generally have a large number of compartments or cubbies to serve as individual nest holes, they are also elevated to deter predators. The shape of a dovecote varies widely; circular, square and octagonal dovecotes are all relatively common. Typically, the structure of the older and traditional dovecotes are large enough for someone to walk inside, and it was hollowed out, with the cubbies lining the inside walls. These dovecotes are very few and far between now as over the years they have been demolished or have been neglected. The remaining traditional dovecotes are protected to help preserve their history. 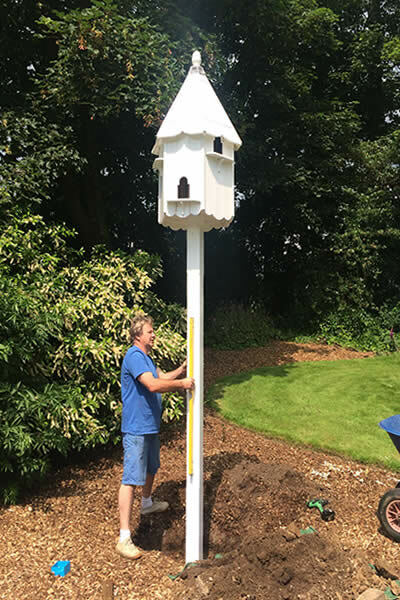 In addition to the large traditional brick dovecotes, it is also possible to find much smaller structures, which are designed for estates, public and private gardens of any size. 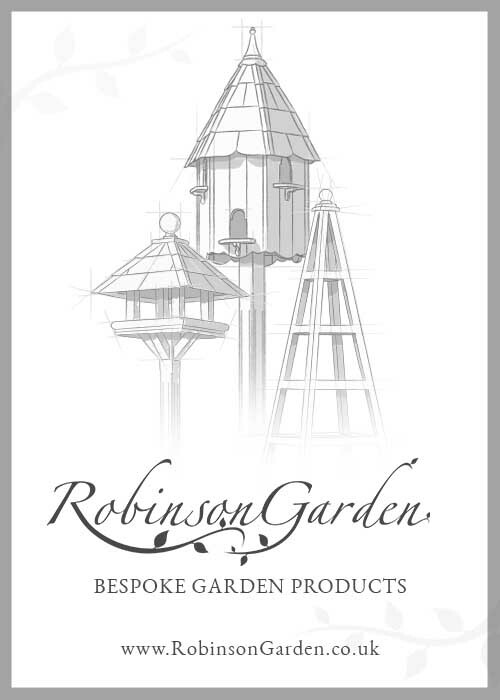 At Robinson Garden we specialise in producing wooden dovecotes that house up to six pairs of doves in specially crafted individual compartments to house each pair, making it ideal for a casual hobbyist who likes keeping birds but doesn’t want to invest a lot of time and energy.